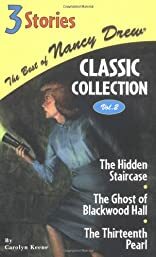 #2 The Hidden Staircase: Nancy must use her courage and powers of deduction to solve the mysterious happenings in an old stone mansion. #25 The Ghost of Blackwood Hall: Nancy and her friends travel to the colorful French Quarter in New Orleans to search for missing jewelry and to solve the mystery of the Ghost of Blackwood Hall. #56 The Thirteenth Pearl: Nancy?s search for a missing pearl takes her on a journey to the Far East.